Process equipment energy requirements (pumping, aeration, solids handling). Energy recovered from the organic matter and heat in wastewater. Building energy requirements for lighting and Heating, Ventilation and Air Conditioning (HVAC). Direct GHG emissions (methane and nitrous oxide) from biological processes in the treatment plant, as well as outside of the treatment plant (receiving waters and sludge land application sites). GHG emissions from truck fuel consumption in sludge disposal or chemicals delivery. The distance and elevation of the wastewater treatment facilities dictates whether wastewater needs to be pumped (as opposed to gravity flow). The wastewater treatment energy depends on the volume and concentration of the water collected. Collection systems with high infiltration and rain water collection lead to less efficient treatment. Collection systems with long detention times allowing for anaerobic organic matter decay, may lead to the use of chemicals in the treatment to ensure nitrogen removal. Recycled water treatment can be impacted by wastewater treatment because the amount of wastewater to be recycled will depend on the amount of wastewater generated. The recycled water treatment system design and energy consumption is generally influenced by the amount and quality of source water available from wastewater treatment plant effluents. The wastewater treatment energy depends on the volume and concentration of the water collected, as well as the total organic and nitrogen load. The energy recovery potential is proportional to the organic load. End users using excessive amounts of water may dilute the wastewater. End users using garbage disposal for organic kitchen waste will increase the concentration of the wastewater and the total organic load. The distance and elevation difference between the wastewater treatment and discharge impacts the energy requirements or recovery potential. Furthermore, if there is no wastewater treatment, then the direct GHG emissions resulting from the direct discharge to receiving waters range between 30 and 45 kg/pers.year. (Semi-)Centralized wastewater treatment may require the end users to have individual pretreatment (septic tanks or advanced pretreatment for industries), which may impact water usage and energy requirements. Use the biogas production to produce energy for powering various process-mechanical equipment. Specific equipment / installations are required. High capital and operational costs. Reduce energy consumption / GHG emissions. The method of cogeneration of heat and power (CHP) is a key solution to improve energy efficiency and thus to reduce CO2 emissions at a WWTP. A CHP plant consists of an electrical generator combined with equipment for recovering and using the heat produced by that generator. The generator can be a prime mover such as a gas turbine or a reciprocating engine. Alternatively, it may consist of a steam turbine generating power from high pressure steam produced in a boiler. Normally depending on the efficiency factor 30-40% electricity and 60-70% heat can be generated out of 100% biogas. The heat produced at the WWTP is normally used to heat up the digesters depending on the process (mesophilic or thermophilic treatment) to 37° or 50°C. Nowadays heat can also be used in new sludge treatment concepts such as sludge pre-treatment (e.g. hydrolysis) which needs temperatures between 40°C up to 160°C (depending on the process). Exact heat balances have to be carried out before decision making for heat use on site. Specific installations are required. Save energy and heat consumption; reducing CO2 footprint; saving operational costs; coming closer to energy-neutrality or evening more energy-positivity. If the WWTP will have surplus heat and internal usage of heat is covered the possibility to supply the neighbouring areas with the heat produced during the treatment is possible. Save energy, GHG emissions, and heat consumption; gaining additional revenues. 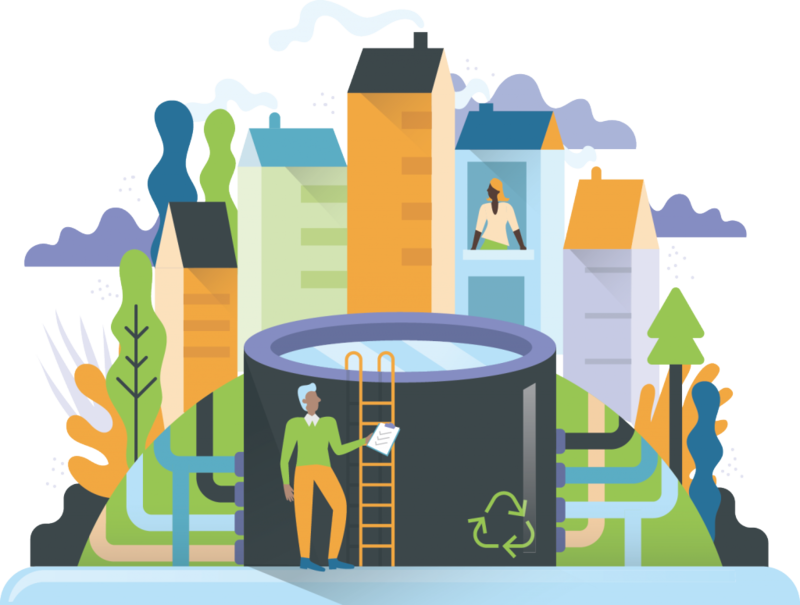 Municipal wastewater treatment in Europe currently requires a significant amount of energy to eliminate organic matter and nutrients such as nitrogen and phosphorus from the sewage prior to its discharge to receiving waters. 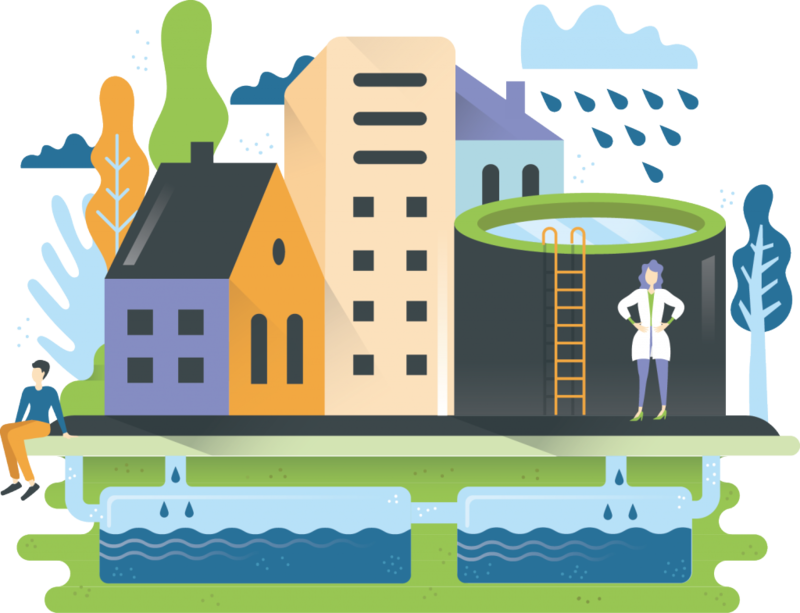 Under the assumption of an average electricity demand of 32 kWh per capita and year for large wastewater treatment plants (WWTP) as current benchmark , the municipal wastewater sector within the European Union (EU) consumes at least 16,000 Gigawatthours (GWh) per year for its service, which is equivalent to the annual power generation of two large (1,000 Megawatt) power plants. By using the chemical energy content (as COD ) as well as having the right combination of technologies to require also finally also the limiting values for discharging (which is the first goal of a wastewater treatment plant) your WWTP can become energy-neutral or even energy positive. The investment cost associated to energy neutrality or even energy positive plants may be high, but the energy savings often make this approach economically feasible. Energy neutral or positive plants may only be achieved under specific design configurations and using different combination of treatment processes which are always site specific and cannot be generalized. The facility becomes independent to power cost fluctuations. Temperature of water in sewers often varies between 15 and 25 degrees C. It represents a major pathway of heat loss from modern buildings. Through the installation of heat exchangers in large sewers or at the treatment plant, a small portion of this thermal energy can be recovered and used by heat pumps for local heating of buildings. By reducing the wastewater temperature, the treatment process may be affected (slower degradation). The minimum design temperature of the treatment plant should be considered when designing the heat exchanger. Global management solutions, guidelines or general information of interest for urban water cycle. Sludge is a source of GHG emissions. By further treating the sludge in digesters, biogas can be produced and collected while emission to the atmosphere are reduced. Surface aerators or diffused aerators are possible. They improve the oxygen uptake as well as flow patterns in the lagoon and accelerate and enhance thereby the biological processes. The development of aerobic granules has several advantages, these include good biomass retention, the ability to withstand shock and toxic loadings, and the presence of both aerobic and anoxic zones inside the granules which can simultaneously permit different treatment processes to occur. 1. Formation of aerobic granules is complex and results from interacting physical, chemical and biological factors. 2. Granule density and granule size greatly influences the specific COD removal rate and the specific oxygen uptake rate (SOUR) because of the mass transfer. Filter presses can be more efficient than sludge centrifugation. Screw press can be more efficient than sludge centrifugation. Amounts that can be processed by a screw press are limited.